An exercise in Nikon Nostalgia. Out shooting an assignment with a D300S and a D700. Here is the dynamic duo that I used to complete a P.R. assignment this past Tuesday afternoon. 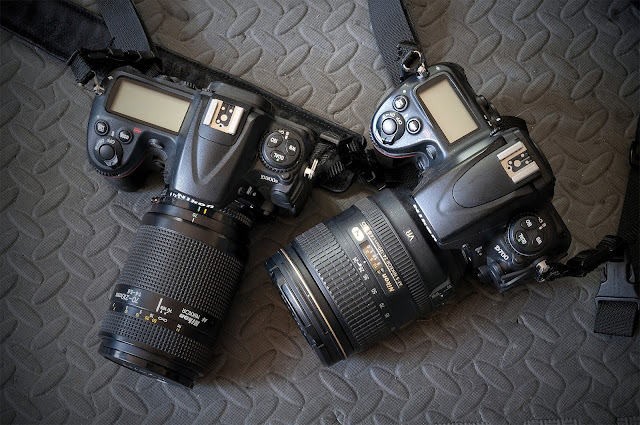 The camera on the left is a D300S and the camera on the right is the D700. The D300S was equipped with an old, push-pull 70-210mm zoom lens with the D700 sported a slightly used 24-120mm f4.0. Why were they a good choice for this assignment? Yeah, I know this is all a bit crazy but I've reacting to the widespread false narrative that working professional photographers need to be using the newest and highest performing cameras on the market in order to get the shots that pay the bills. Actually, I'm beginning to think that in many cases nothing could be further from the truth. About a month ago I started getting interested in cameras with fat pixels. I think some of them, because the pixel sites are so much bigger, have a different look to their files. In many applications the files actually look sharper and better defined. I can't argue about situations where raw resolution is essential, vital or otherwise preferred but in uses where the file's resolution exceeds the resolution of the final target my preliminary dive into the issue seemed to confirm to me that there is an aesthetic difference that most people can see. I won't go into the "why" of the effect; I am certain there are smarter folks here on VSL who can explain the science or engineering behind my observations. The obvious cameras to grab from the dusty used cases were the ones where the biggest sensors have the smallest number of total pixels because....each pixel is bigger. This led me back to the D700 which has pixels that are bigger than 8 microns across. For reference the pixels in my GH5 are about 3.3 microns across. My intuitive break point between bigger pixels and smaller pixels seems to be set at about 5 microns. At that size and smaller I'm thinking the pixels are small while at anything over 5.x microns the pixel are in the larger camp. Anything over 7 gets me into a zone that yields the visual effect I've come to identify as the big pixel look. There are several cameras I've owned that had enormous pixels and, even with the huge pixel wells they were still plagued with high ISO noise that was off the charts, so I want to make it clear that what I am seeing is not about noise or lack of noise but more about edge effect, acuity and the perception of file sharpness. The Kodak DCS 760, the files from which I was always impressed, clocks in with pixels that are 9.18 microns while another favorite, the Nikon D2HS has pixels that re 9.32 microns. Even though the last two cameras are not full frame it's their pixel size that sets them apart in my mind. In contrast the Nikon D800e whose files are nicely detailed but which lack, for me, a certain snappy look have pixels that are closer to those of my micro four thirds cameras at 4.87 microns. Even my D2XS and D300S cameras have pixels that are 5.48 and 5.51, respectively. This may account for the perception that the D2XS files seem sharper if neither the D800e files or the D2XS files are used in final targets at more than the native resolution of the D2XS. We get the benefit of the greater perceptual acuity of the older camera and its illusion(?) of greater sharpness. At any rate my curiosity has led me to buy and borrow various cameras and to test their files at various magnifications to see, just perceptually, which ones yield files that look most photographic to me. (And be aware that this could be a prejudice of visual habit, of variations in each camera's contrast rendering and a host of other parameters). I've shot some files with a camera I never owned; the Canon 5D, and can see how it pushed the 5D line into prominence. Big pixels and nice tonality with an undercurrent of well managed sharpness. Recently I added a D300S to the mix because I found a treasure trove of old concert photo files that I re-imagined in the latest rev of Adobe's raw converter and was pretty surprised at the quality inherent in the files. So my curiosity about bigger pixels is now intersection with the idea that older cameras created raw files that contained much good information that was neglected or sub-optimally processed by older raw converters which led us to conjecture that it was new camera hardware that was making newer cameras seem cleaner and better when, in fact, it may just be the continual introduction of much more processor power being available to process the files which has led software engineers to be able to distill more detail, color information and nuance from all files. This also seems to be apparent as I test more stuff. But at some point you have to stop testing and go out to shoot some jobs for clients. Otherwise, how will we pay for the boxes and boxes of new stuff that we're hauling back from the camera stores? I was asked to do photographic event documentation for the groundbreaking of the new site for the headquarters of the Boys and Girls Clubs of Austin. In our pre-planning phone call the marketing director let everyone know that the ten acres had just been cleared and that the dust and pollen on site was plentiful. A continuing dry spell wasn't helping but bulldozers pushing the dry dirt around were the biggest culprit. We would walk a quarter of a mile to access the space and the whole event would take place without a covering tent. We would be in full sun on the hottest day of the year so far, in the middle of an intermittent dust storm. I'm sure you can see where I'm going with this; if there was ever a case for having a couple of "trash cams" to take into the field this would be one of the front runners. I chose the D700 because the full frame is a nice match of the flexibility of the 24-120mm f4.0, which is the only image stabilized lens I have for that system right now. I grabbed the D300S because it was a good match for my only really long Nikon lens right now; a lowly 70-210mm f4.0-5.6 consumer zoom which is actually very nice for outdoor stuff. I put each lens on its body before I left my car in an attempt to keep the sensors as dust free as possible. Then I stuffed both rigs into my all purpose Amazon photo backpack and trudged down a quarter mile dirt and dust path to the location. With ND filters on both cameras I was able to use on camera flash to add many stops of dynamic range to the system which was very advantageous for shooting in direct sun. The flashes were used in a total manual mode with me riding the power settings for various distances. I photographed a group of cheerleaders from a local school who opened the program. There was a drum band and then speeches by politicians, donors and board members of the organization. Every time the wind whipped up a cloud of dust and debris swirled through the crowd. By the time the event was over and I had ambled back to my car my dark brown hiking boots were covered with a light gray coating of dust. My cameras were speckled with dust every where and the fronts of the filters looked as though someone had misted them with dust. When I got back to the studio I swept the dust off my boots outside the office door. I grabbed a can of compressed air and carefully sprayed off every square inch of each camera and lens, trying to make them as dust free as possible. I used an artist's paint brush to dust off any resilient dust specs before opening the memory card doors and pulling out the cards. The files were uniform and good. The flash helped lift the shadows a good bit, putting them into a good level and allowing me to just finish off the files with a lift of the shadows in post. I edited down from 600 shots to 300 shots, color corrected and tonal corrected each shot (usually in small groups) and delivered them the same evening. Shooting raw, setting a smart color balance and using fill flash judiciously were all ways of equalizing whatever improvements have been made in sensors over the years. The raw converter seems to lift all boats. If either camera had been compromised by the dust and rendered unusable it would be much less sad than losing a shiny, new camera for which I had paid the full retail price. This was one of the many situations photographers work in frequently where just about any pro caliber camera made in the last 10-12 years would have acquitted itself well. The files are ample, the colors great and the overall look of the files generated is right in line with the work we expect from today's cameras. If you think my P.R. client, posting images to the web and for mostly online use, really needed the latest medium format, 50 mp file camera to document an event like this----you are nuts.